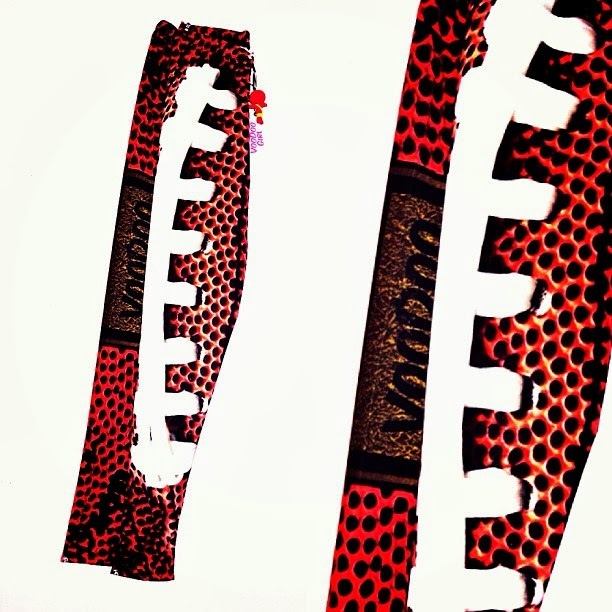 Add the perfect pigskin print to your game day style with these Voodoo Girl leggings. The laces out print and comfortable styling make these a must have for finishing off your sports on Sunday style. Even though Pittsburgh tried to steal a win against the Bears it was the Monsters of the Midway and Mr. 4th Quarter that came out with the "W". The game started out with all the markings of a blowout. Finishing the 1st quarter with a 17 unanswered points and followed by a Major Wright pick-6, the Bears looked unstoppable with a convincing 24-3 lead heading into the middle of the 2nd quarter. But the Bears offense became stagnant and Roethlisberger found his groove and the Steelers slowly chipped away at the Bears' 21 point lead. The Steelers were able to convert a later 2nd quarter drive into seven points and left with the momentum and the ball to start the second half. The Steelers rocked the Bears in the third quarter taking 10 points to the Bears 3 and closed the gap to make it all about who played a better 4th quarter. Then Cuter came on and convincingly lived up to his "Mr. 4th Quarter" moniker. With a must-score drive in jeopardy Cutler ran for 13 yards and leaned his shoulders out to take a hit for the team. After that example of leadership we continued to make the needed plays to score a much needed touchdown off of a miraculous catch by Earl Bennett. We needed a challenge to get the correct call (Refs were especially bad this game) but in the end is created the two possession lead we needed to finish out this game. To add the cherry on top Julius Peppers recovered a fumble and ran 42 yards for the touchdown that took away any hope for a Steelers comeback. It's great to see the Bears finishing off games in the 4th quarter and racking up wins, since we have big games coming up again Detroit and New Orleans it's nice to have a bit of a cushion. Speaking of the Detroit Lions we'll be facing them this Sunday and it will definitely be a scrappy game at Ford Field. With Henry Melton out for the Bears and WR Nate Burleson out with a broken forearm due to a pizza-induced car accident we'll have to seem which team toughens up - my bet's on the Bears. And for a football inspired outfit this Sunday take your favorite shapes for everyday like a form fitting tunic and printed leggings but with a football theme. A trippy transparent jacket and slip on flats finish off this hut-hut-hot game day look. Use the hashtag #BearDownBabes and show me your Bears Fashion for Week 4!